Just off Clyborn at the river, across from Webster Place. Atmosphere is bohemian; rustic, stylish, upbeat and fun, despite being dark, boisterous and noisy, and crowded; and I suspect it'll be cold in the winter months near the front door. If you didn't know better, you'd think you were in Greenwich Village or Tribeca. Food - Menu is limited, basic, but fundamental with selections of duck, lamb pork, beef, even a couple pizzas, complemented with a nice selection of cheeses - fresh, creamy, and intense; pate, soup, salad and some enticing desserts. All are wine friendly and targeted to accompany a wine tasting. Preparation and presentation like the selection was basic, fundamental, but well done. 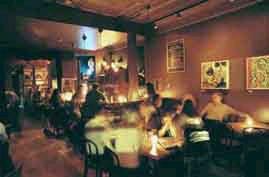 Wine - This is a wine bar first and foremost so the Winelist is the reason d' etre. There are thirty wines by the glass, nine different wine flights, and a broad list of 400 bottle selections that touch on all essential and major wines at various price ranges from top to bottom. There are Americans from California and the Northwest, French from Bordeaux, Burgundy, Rhone, Provence, Italians, Germans, Australians, Spanish wines and South Americans. The selection is imaginative and well done. Prices are reasonable to slightly high for the high end wines. There are Flights for Cab & Merlot, 'Euro Classics', Pinot, Spicy Reds, Summer Reds, Chardonnay, Classic Whites, Aromatic Whites, and Summer Whites - each containing 2 ounce pours of three or four selections from the class. You won't be disappointed and you'll likely find something to try or an old faithful friend. Most likely, you'll find several selections you've heard of but not had, and many new discoveries as well. See Wine Journal Review. Service was friendly, attentive, efficient and gracious, even accommodating us with a requested table change effortlessly and kindly.